Oh. My. Word! We are back at it. 34 Weeks of Clean starts next week and I would be lying if I said I wasn't a bit nervous about the journey. We just retired from the military after 26 years, moved into our "forever" home, and are still in shock that we are living in sunny Arizona. Lots of changes have taken place in our lives and we are still trying to find our new normal. BUT, like you- there is always a new project waiting for us. And let's face it, it is much more fun when you work as a team! So let's get started! You CAN do it! Our first run of 34 Weeks of Clean (several years ago) proved to be helpful to many. With a little hard work and a lot of cheering from friends, you too can take your house back! How did this craziness all begin? 34 Weeks was a project born out of the need to keep busy during my husband's year long deployment, but turned into a passion I did not even know I had. Yes, I have always loved lists and schedules and calendars and been a little type-A about my house, but what I did not realize was how passionate I was about helping others take control of their homes and the stuff within. 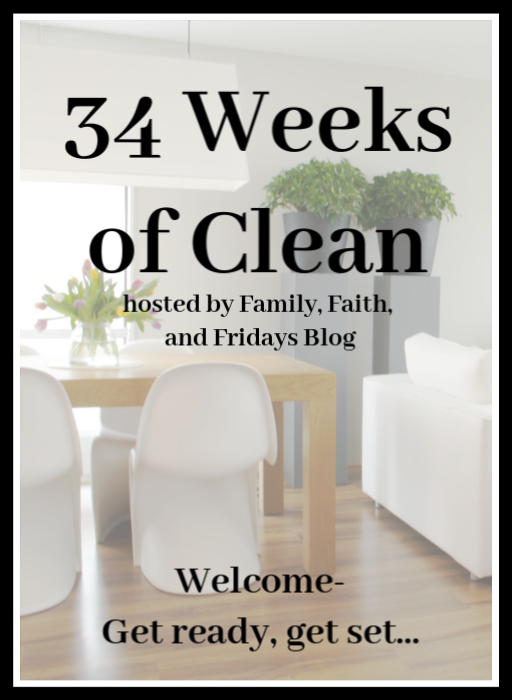 34 Weeks gave me the opportunity to share some hints I have learned along the way and since then has even allowed me to speak with a MOPS group about how to declutter and clean, making your house a place that will be filled with God's peace, and allowing you to open your home to others. 34 weeks not only became a verb in our home and others, you know- "What happened to that basket?" "Oh, mom 34 weeked it! ", but it also buried itself deeper and deeper in my heart. We never run out of the need to clean, declutter, and take control of our homes. It is NOT a one time deal, as nice as that would be. Maybe because I am a glutton for punishment! ;) Not really. So many of you asked, so here we are. Whether or not I posted, my family would be following this schedule. It is just what we do. I am thrilled that so many have found it to be helpful in their lives as well and it is fun to share and compare notes each week. Cleaning, decluttering, and organizing are not just a one time fix. Our homes do not remain static, no matter how hard we try - thus the need to "rinse and repeat," as one friend put it! It just worked out that way! Can it be done faster? I am sure it can. But take it from those of us who have done this before - if you push too hard or try to work ahead you risk burnout. This is not a race. Our homes did not get to the place they are now in a day and they will not be magically fixed in a day! What does joining us mean? That you will follow along as we go! No need to subscribe (although we would love for you to subscribe) and nothing to fill out. No fees! No contracts. Just hop on the blog each Monday for the week's assignment. If you want an easy reminder, make sure to like our Facebook page- links will be posted there each Monday! How you tackle the assignment is up to you. No one's house is quite the same and no one works in the same manner. In addition, some projects will be harder or more time consuming than others. If you work during the week, you may find working on weekends is best for you. If you are a busy mom of multiple children, you may enjoy enlisting their help and working as a team. If you are a night owl, 15 minutes a night may be best for you. Find what works for you and go for it! Do I need to report in? Nope! But we would love it if you would help us encourage others by checking in occasionally! We love when you post pictures on our Family, Faith and Fridays Facebook page! It helps inspire others, really it does. What if my results don't look like yours? OK, I made that question up. But I want to say this - everyone's idea of clean is different. Everyone's idea of decluttered is different. Everyone's idea of organized is different. We ARE ALL DIFFERENT! This is not a competition. It is a chance for YOU to take YOUR home back. Enjoy YOUR results and know you are doing a GREAT job! Why one week at a time? Because these are not small projects. We are deep cleaning, de-cluttering AND re-organizing! Yes, it is a challenge. Yes, it is worth it! In the end you will feel like you have a new house and a new lease on life. Trust me, I know! It is freeing to unload stuff you don't need or love. It feels good to walk into a house that is clean and says welcome. And it saves much time and effort to live in an organized house! I know some of you have gotten industrious and moved out a lot of stuff already. Can I just encourage you to slow down a bit and wait for the rest of us? It is exciting to get started but I know from experience that those who bolt out of the starting gate at lightening speed are usually the ones that fade out the fastest. There is a reason we tackle one project or area one week at a time. 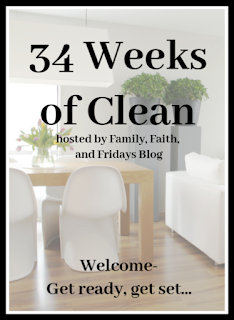 34 Weeks of Clean- our houses, our messes, and ALL that it encompasses is just one tiny part of our lives. We must not let it become an idol. It should NOT consume our lives. (shhh, don't tell my kids!) I truly believe your life can be blessed by 34 weeks, but there are many other blessings out there you don't want to miss. Clean, declutter, and organize with us each week and then GO, enjoy your life. Let me say it again, don't work ahead! Please. You will wear yourself out in just a few weeks. Take your time each week and do it well. Don't give up! You CAN do this and you WILL be blessed by it! Just remember it is a journey not a sprint. Your house did not get in the shape it is in one day. It is a slow creep, and it takes time to reverse the mayhem. Be ready to clean, purge, and organize your house back into shape and cheer each other on! I am so thrilled you are joining us on this adventure! Can't wait to get to know you! A quick family update, because some do come just for that! Crazy, right, but when you live far away from family, it is the way many of us keep in touch. Riley our college senior arrived home last Tuesday. Yay us! We gave her one day to acclimate to the house (she only saw the new house when we were house hunting), and then we headed to Disneyland for a few days. Since it is only a 6 hour drive we knew we couldn't pass up the opportunity. With our kids getting older by the second, we know our family vacation days are numbered. There is so much a could share with you but I will keep it short for sanity's sake. The Pleasants do theme parks like a military mission! Go, go, go, go, GO! Some things never change. Riley is a great leader. She told us where to go and what to do, and we just went along for the ride. That girl belongs there! Disneyland is much more laid back than Disneyworld! Love both, but seriously, this vacation was actually relaxing! We picked awesome dates to visit. Not sure if was the weekday choices or the specific week, but we had SHORT wait times (10-20 minutes) the whole time. Max pass is a gift from God. Ok, maybe a slight exaggeration, but seriously, worth the extra pennies. I am thankful that we walked 5-8 miles each day, because Disney food is yummy. Just saying! Riley turned 21 while were there! Can't think of a more perfect place for her to be for a special day! A few just for fun! We had such a great time and are thankful we were able to sneak in a quick trip. If you haven't been- add this to your bucket list. 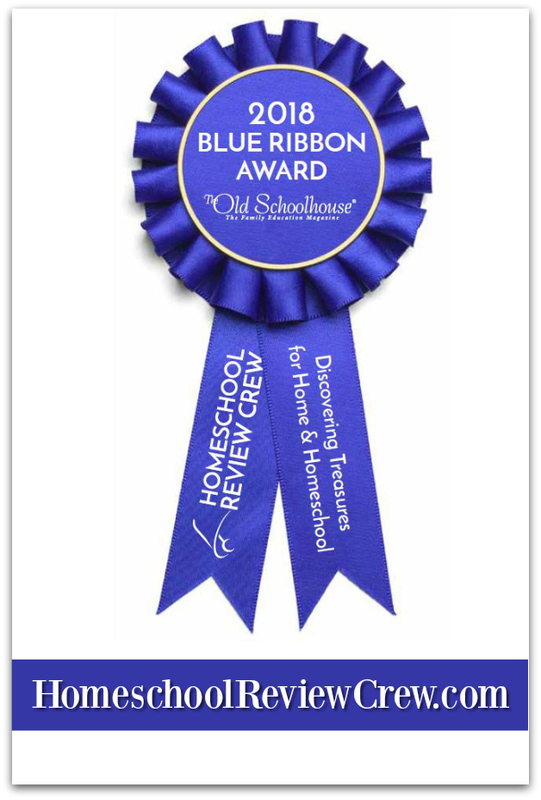 Each year The Homeschool Review Crew gives out Blue Ribbon Awards for their favorite review products of the year. It is a much anticipated event among the Crew and sometimes the competition is fierce. This year was no exception, as we were blessed by so many amazing vendors and curriculum this year. The voting is finished and the results are in! Though it was a close race in several categories, 22 companies rose to the top out of the 66 total reviews the Crew did for the year. That is over 4,500 review, you guys! I am not going to tell you all which ones I voted for, but I will share the reviews I did for some of the winners! As Product Manager for the Crew, let me tell you that all our vendors are winners in my book. One of the cool things about homeschooling curriculum is what doesn't work for one family may be perfect for another. That is why I always give you an honest opinion of what we have used and then encourage you to check it out for yourself. Our kids are all unique and have different likes and needs. As you explore these vendors, keep in mind that many have gone before you in using the products and the reviews out there are to help you navigate your decisions. The Homeschool Crew may be fairly quiet for a few months, but have no doubt we are getting ready for another big year of more vendors and more products. Get ready to be blessed in 2019! Apologia- All of their science programs are amazing! Sometimes you just need something fun to do with your child, right? Not school, not running errands, not going to appointments- and certainly not spending money! We are all so busy these days, so sometimes it is just nice to snuggle up together and have a little quiet fun! 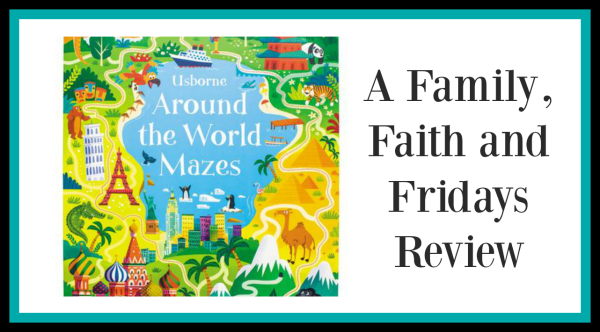 Usborne Around the World Mazes to the rescue! I always loved doing mazes as a child so I was excited to review Usborne Around the World Mazes, for ages 6 plus, from Timberdoodle with Colby. He is 11, currently in 6th grade, and loves mazes as much as I do! Score! This beautiful, full color maze book has 45 mazes in it. They begin fairly easy and get harder as you work through them. Some are only one page, while others branch across a double page spread. Each has a different travel theme, introducing new places and things to see. Armed with a pencil in case we made mistakes, Colby and I have tackled the mazes a few at a time together. He usually traces the path with his finger first and then once we get it figured out, he goes back and draws the line in. The first few were indeed pretty simple, but they quickly got more challenging as we went along. Two that we have done we ended up going to the end of the puzzle and working our way backwards. Is that considered cheating? Don't worry, there is an answer key in the back for each puzzle in case you get stumped! And best of all- they are just plain fun! I love just about everything that Timberdoodle carries, whether a stand alone product or one that is part of their curriculum kits! Usborne Around the World Mazes is no exception. There is still time to order a copy for a special child on your Christmas list!